NEXT RUMMAGE SALE: April 27-28, 2018. Set up: April 25-26. 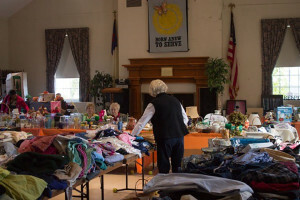 Emmanuel Lutheran Church holds a rummage sale twice a year in the spring and fall. The Women of Emmanuel host and organize the sale in Kask Hall. The week of the rummage sale after Sunday services,congregation members can bring donations of clothing and household goods (no text books, TVs, computers, electronics or unusable clothing) and leave them at the back of Kask Hall. Rummage sale volunteers sort and arrange goods for sale during the week and the sale is held on Friday and Saturday. The sale is open to the public and benefits local people needing inexpensive clothes and items for the house. After the sale ends mid-day Saturday, the unsold items are collected by the volunteers and donated to a local charity. Proceeds from the sale are used for church improvements not funded in the operating budget, such as new dishwashers, and Calumet camperships. Adult or older youth volunteers, male and female, are needed to sort and organize sale items, staff sale tables, transport unsold items after the sale, clean up Kask Hall, and prepare and serve lunch to volunteers. Please contact Arlene Cegelis if you can volunteer for any of these tasks.